For a film with a one-word name that has not been heavily promoted, it’d be difficult to see it gaining heavy traction with moviegoers. I really hope this will not be the case for Room. The drama, directed by Lenny Abrahamson (Frank, 2014) was adapted from the best-selling novel of the same name by author Emma Donoghue. Young Jack (Jacob Tremblay, Before I Wake, 2015) is an inquisitive five year-old who is looked after by his loving and dedicated Ma (Brie Larson, Trainwreck, 2015). She devotes her days to keeping Jack happy and doing normal activities like baking, playing games or make believe. What isn’t normal about their situation is that they are trapped in a windowless, underground 10’x10′ space with one skylight, which Ma named “Room.” As Jack’s curiosity about their lifestyle heightens, Ma’s patience thins and she starts to help him connect the dots to the many stories he’s heard and shows he’s seen on their small TV. One day, the duo plots a very risky escape plan to reach the scariest most unknown place, the real world. Room includes remarkable performances by Larson and Tremblay. The dynamic and emotional mother-son relationship is astonishing. It’s amazing to see them get through each day and essentially stay ‘sane’ with a combination of imagination, love, devotion and resilience. Audiences are constantly guessing from the first take. Why are they there? Is being below ground in a windowless room for protection, or was it not their choice to be there? How long have they been there? Who is Jack’s father? How do they receive food, water and power? The list of questions goes on. As the film continues, audiences receive clues, however, and these clues ultimately lead to more questions and raise the tension. Ma’s parents played by William H. Macy (Cake, 2014), and Joan Allen (A Good Marriage, 2014) do not receive enough screen time or character development. Without spoiling too much, I also thought that the storyline became too convenient during the last three quarters of the film. The characters’ knowledge, locations, and placements were almost too ideal, but it didn’t ruin the overall film. 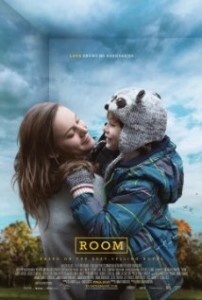 Production designer Ethan Tobman created the physicality of room with cinematographer Danny Cohen (an Oscar nominee for The King’s Speech), which was quite a feat. While creating one room may seem simple, it actually involved more challenges. According to Cohen, “It sounds very straightforward to shoot in a single room but, in this case, it was the opposite. There was a constant balancing act. There’s the important fact you need to get across that this 10’x10′ room is the only place Jack has ever known … and then there’s the reality of trying to make that work as a piece of cinema.” Since the setting was so limited, Abrahamson and Cohen were determined enact a constantly shifting mood and perspective. The room needed to feel claustrophobic and small, so the audience could empathize with what Ma was enduring, while at other times, it needed to feel like a big, limitless space to Jack. A great addition to this storyline is the fact that Jack is the narrator. Audiences view the world from his tiny and uninformed perspective. He’s never known what it’s like to feel a gust of wind, pet a dog, or interact with other kids his age. The modern world is whatever his imagination can make of it. Some have praised Tremblay’s performance so much so that they’ve compared it to young actor Quvenzhané Wallis from Beasts of the Southern Wild. Bottom-Line? The title itself is not enticing, but don’t let that fool you. Room is an incredibly powerful and poignant story about a mother-son bond that is indestructible despite the hardships they endure.